You sure heard of the Internet blackhole Egypt lived in when Mubarak's regime shut down the whole internet during January revolution. Other countries are filtering and censoring the Internet, Tunisia, Syria and Iran are just few examples. And recently the availability of the internet to the demonstrators in the Occupy Wall Street movement is an essential issue. Let me first give you quick brief about Wireless Mesh Network, normally at our homes we connect our access point to the internet via some sort of wired technology, for example ADSL. But let's imagine if I decide to get my ADSL connection then can give that internet I have to my neighbour's Access Point wirelessly, and he on his turn give it to his neighbour and so forth. So we will end up with having one internet connection shared among us. You can compare it to peer-to-peer file sharing (Kazaa and Torrent), where users are connected in a sort of mesh network. Basically, the above description is how a Wireless Mesh Network look like, and it is already used but in different scenarios. 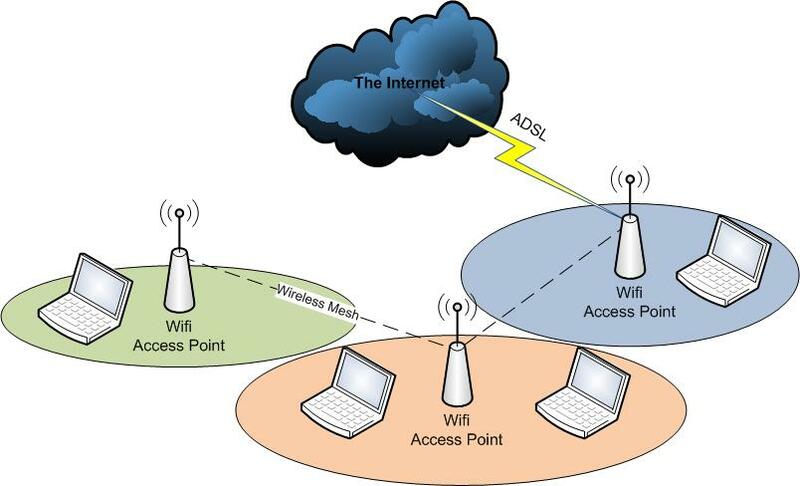 When you need to have wireless coverage outdoors, you normally need many Access Points to cover the whole area, but also it is hard to get dedicated internet access to each of them, so you end up connecting one of them to the Internet ADSL hose, and then share that internet connection from one to the other using mesh topology. Now from what I've read in the Free Network Foundation website, they are looking forward to have a similar mesh network that spans a whole metropolitan area or city, and in the first stage each of those cities will be connected the other cities using the internet, but I can see that they have plans to use underutilized spectrum in the VHF and UHF bands to connect those cities without the need of the Service Provider's infrastructure whatsoever, i.e. we will end up by replacing the Internet infrastructure we have today, and people will not be required to go to the Internet Service Providers or Mobile Network Operators for internet access any more. How would such a system create cheaper Internet for everybody? In the initial phase, people will be sharing their internet connection, so they will be saving money, and as you can see, their future plan is to totally replace the ISP's and MNO's so it decrease the internet access prices dramatically if not making it free. But in my humble opinion, making the internet cheaper is just one benefit, but the most important benefit here, is that it will make it free from the government and ISP's censorship and control. Well, we already have seen small scale examples of what they are willing to do, so technically it should be feasible, however I believe there will be many other obstacles such as legal or economical issues. For example, here in Egypt, no one is allowed to cover public areas using Wifi, without having license from the government, and this might be the case in different locations, and if not, Mobile Operators will sure lobby to ban such thing, as it will directly harm their business. Also, I believe I can compare the FNF to Web2.0. In Web2.0 the user-generated content is generated by users, and here the infrastructure is made and operated by the users as well. And while being at this analogy, huge part of FNF's success relies on users participation. Facebook's success is totally dependant on the user's participation there, and the number of photos and content they share, like and comment on, and so is FNF, it will only succeed if millions or hundreds of millions decide to participate in it, other wise it might fail. Where are wireless mesh networks typically used? Nowadays it's typically used in covering outdoor areas, but as far as I know, all the available mesh networks are like separate islands each of them is built and controlled by a single business or governmental entity. FNF should do to the state of wireless internet access what Gnutella and Kazaa did to file sharing, where the connection gets democratized and the network infrastructure will be owned and controlled by the people. Have they ever been used in a protest context? Many people though of a similar solution when the internet was down in Egypt, during January revolution, but it remained an idea and I am happy to see FNF taking it further. During the revolution (after the internet came back), people living near Tahrir square opened their Access Points for the demonstrators to use freely. Although what they did is a very basic thing compared to FNF plans, however it shows the need for such solution, especially where governments can either totally shut the internet down or at least censor it. What is the difference between a WMN and VPN? They two are very different. 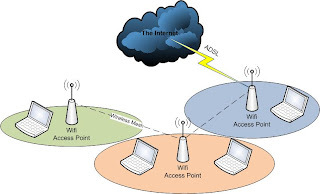 WMN (Wireless Mesh-Network) is meant to provide physical layer connectivity to users, while VPN (Virtual Private Networks) are built on top of that connectivity to provide connectivity and security (encryption) in the upper layers of the internet stack. To make it easier to understand, you can consider WMN as the roads and streets that connect our houses together, while VPN is the cars that run on those streets. Without the roads, no matter how good are the cars you have, they will be useless. VPN can help fighting governments censorship of the internet, but WMN can fight both censorship and internet blockage as well, which VPN's can't deal with. Hint: This is basically how I understood the FNF ambitious initiative, and here are links to Mesh Networks, Sovereign Computing, and Packet Radio projects listed on FNF website.